A fibrillation of the heart, if untreated, can lead to cardiac arrest and death. 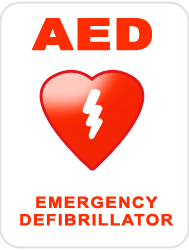 The defibrillator, if used as soon as possible, is an effective means of neutralizing the fibrillation. Used externally or internally, defibrillators have been used by paramedics for over 60 years. They are relatively easy to use, and are accessible in many public places. Countless lives have been saved because of them. Though fibrillation of the heart had been documented for thousands of years, it wasn’t until 1849 that it was realized an electrical stimulus could induce the condition. German physician and psychologist Carl Ludwig and his student M. Hoffa discovered that when an electrical stimulus was applied to the heart, the cardiac muscles of the ventricles trembled. In Ludwig’s experiments, this led to cardiac arrest. Artificial defibrillation is the process of restoring the regular contractions of the cardiac muscles by means of an electrical stimulus. Initially this was done with two paddles attached to a large and bulky unit that would appropriately adjust the voltage from a wall socket. Today’s defibrillators are relatively lightweight and portable. The defibrillator was invented in 1899 by psychologists J. L. Prevost and F. Battelli. They discovered that while a weak electrical stimulus could fibrillate a heart, a stronger one could undo it. Initially tested on dogs, the defibrillator was not used on a human until 1947, by American surgeon Claude Beck. He restored the fibrillating heart of a 14-year-old boy. This success paved the way for widespread clinical acceptance of the procedure. The external defibrillator utilizes two paddles that are applied to the patient’s upper right pectoral and lower left rib. These are the kind often seen on television. Implantable cardioverter defibrillators (ICDs) are smaller and implanted within the chest itself. They are connected to the heart and detect irregularities in rhythms and correct them accordingly, outputting an electric shock if necessary. Transvenous defibrillators are similar to ICDs, except they apply the shock to the middle cardiac vein rather than the heart itself.